Net, Blogs and Rock'n'Roll: Branded discovery? I just came across a series of events branded by San Miguel called "Hidden Depths", which "aim to target people who like to look that little bit further" — see the website and Facebook group. San Miguel Brand manager Anne Morrow said: "We decided to create these events in order to spark people's curiosity about San Miguel, since it's known as a refreshing, premium Spanish beer — but it also has a depth of flavour which consumers really like. By showcasing the hidden depths to these artists, people get to experience a unique night out which also shows the benefits of looking beneath the surface." Businesses have been branding the routes to discovery for some time — as with Bacardi B-Live Radio and MyCoke, and all the way back to the first commercial radio stations. 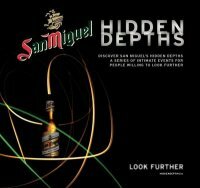 San Miguel seem to be aiming specifically for the leading edge of discovery, being in the vanguard. Will this work? Given what I call Jennings' Law, that people make most of their discoveries elsewhere, I am not sure how easy it is for a brand to 'own' the experience of discovery. What do you think?